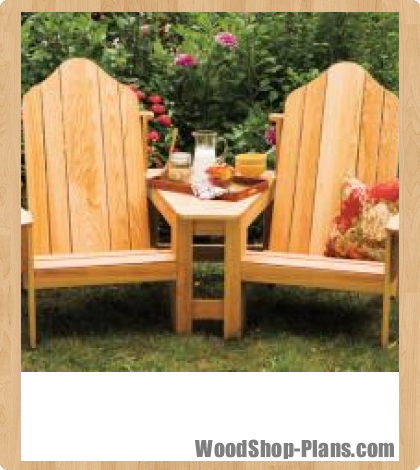 Combine the classic lines and legendary comfort of the Muskoka chair into a two-seater settee and you have the perfect place to share a cold pitcher of lemonade and some engaging conversation on a warm summer day. The key to the design is the wedge-shaped table that positions the chairs at an ideal angle for chit-chat. Add a sun umbrella for shade and even the relentless rays of the midday sun won’t chase you indoors, away from your relaxing oasis. 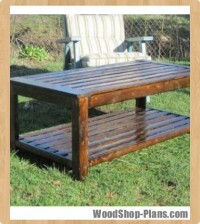 I built my settee from cyprus because it’s durable, lightweight and exceptionally resistant to rot, mildew and insects. 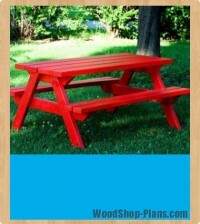 Other good choices for outdoor projects are cedar, redwood and mahogany. For assembly, I used a weatherproof Type II adhesive, galvanized carriage bolts and rustproof stainless-steel screws. I counterbored all the screw heads by 5/16″ and concealed them with tapered wooden plugs after all the construction was done. The most challenging part of this project is the table that links the chairs together. There are a lot of complex angles involved in creating the tapered shape. The joint between the chairs and table also needs to be sturdy so it won’t collapse when the whole thing is picked up from the ends. Get started by cutting the pieces needed to make the corner assemblies for the front table legs. When you rip these parts to width, you need to apply a 75º bevel to one edge by tilting your saw blade 15º from vertical. 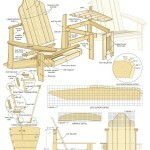 (Take a look at the “Front Table Corner Detais” section of the plans for more information.) After preparing the parts, assemble corners with glue and a few counterbored stainless-steel screws to secure the joints. Construction of the rear leg corners of the table requires a different approach because the sides extend above the level of the table to support the braces for the backrests. Start by sawing the backs of the rear legs. These have a 75º bevel, just like the corner pieces for the front. Next, prepare the rear leg sides that are located on the sides of the table. These parts require a few extra steps to complete because they have a complex shape. Begin by cutting out a 4″-wide x 311/4″-long blank for each support member. You should prepare four blanks in total because two more supports will be required later on for the outsides of the chair assemblies. 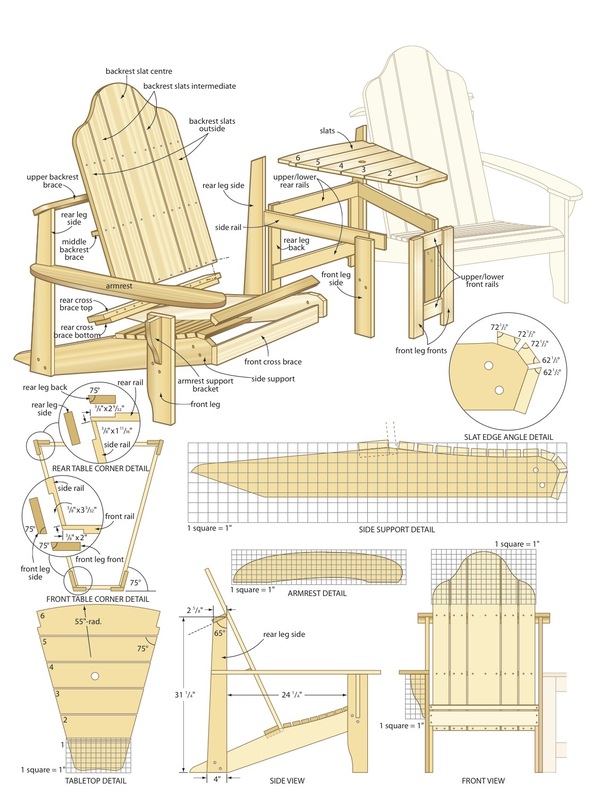 Now, take a look at the plans to see how the rear edges of the rear leg sides attached to the table are tapered toward the top and how the top of the leg is mitred at a 65º angle to position the backrest brace perpendicular to the chair slats. Lay out the tapered section, then make the cuts freehand at the bandsaw while remaining about 1/16″on the waste side of the pencil line. You could sand to remove the saw marks, but a quick trip to the jointer gets the job done with more speed and accuracy. After all this, use the tablesaw or a mitre saw to cut the 65º angle required at the top. As you do, make certain the original edge of the part (not the tapered edge) is referenced against your fence; otherwise, youÂ’ll end up with the wrong angle. The angle on the backs of the tall leg members creates an added challenge when it comes to assembling the rear legs. You can’’t align the corners of the parts as you did at the front. The solution is to scribe a line that runs parallel to the front edge of the supports to reference the location of the inside corner. Offset this line by 21/16″ from the front edge to get the adjacent parts situated correctly. Before you fasten the parts together with glue and screws, make sure the angle of the inside corner measures 75º. I mention this because it’s easy to get the piece with the bevel on the edge flipped the wrong way around. The table leg assemblies are connected by an arrangement of horizontal rails. The ends of the rails are bevelled at a 75º angle to correspond with the inside of the leg corners. Study the plans carefully before proceeding with cross cuts to make sure the bevels are angled in the correct direction. The plans also show how the rails are notched on the ends to form lap joints that fit around the corners of the leg assemblies. These lap joints add a great deal of strength to the structure. You can use a tenoning jig to cut the cheeks for these joints, or nibble away at the waste material by making repeated passes with a dado blade set to cut through half the thickness of the boards. You will need to prepare both upper and lower rails for the front and rear leg frames, but only the uppers are required for the sides. The lower support will be provided by the seat frames when the chairs are added to the assembly. When all the rails are ready to go, assemble the table base using glue and clamps to secure the joints. Make sure the legs are square to the rails before setting the base assemblies to dry. The top of the table is covered with a series of wide slats that are angled on their ends to conform to the wedge shape of the base. A decorative, curved profile is applied to the edges that overhang the front and rear of the base. A grid diagram is included in the plans to help you lay out the front curve. The arc at the back has a 55″-radius. When you install the rear slat, you will need to notch the ends to fit around the tall leg members. I cut the notches at the bandsaw and smoothed the edges using a sanding block. To accommodate the pole for the sun umbrella, drill a 11/2″-diameter hole in the centre of the third slat from the back. To minimize tearout, drill partway through with a Forstner bit, tap a finishing nail through the center point to mark the location on the other side, then flip over the board to finish the job from the opposing face. It’’s much easier to do all this work before the part is installed. When you attach the slats, it’s best to start at the back and work your way forward. The notched corners on the rear slat leave very little wiggle room for adjustments. Cut some 1/4″ spacers from scrap wood to set the gap between the boards and make sure the angled ends are aligned before driving home the screws. 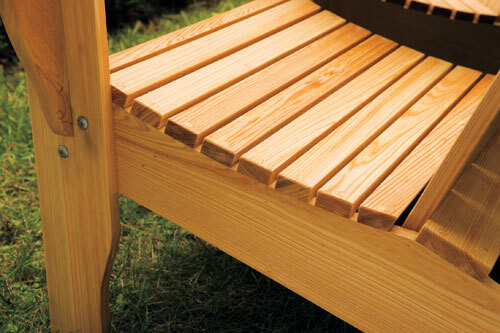 When positioned correctly, the edges of the slats sit flush with the sides of the legs and overhang the rails by 3/8″. The first step in constructing the chairs that make up the sides of the table is to make the side supports that serve as the rear feet and extend to the front to support the seat slats. These parts have a complicated shape that includes several irregular angles and a curved section on top that forms the seat contour. You could measure to lay out each side support individually, but this takes some time and you run the risk of ending up with parts that aren’t perfectly uniform. A quicker and more accurate approach uses a template-routing technique. To begin, prepare a full-sized template by transferring the layout information from the templates on page one to 1/4″ Baltic birch plywood or hardboard. Cut out the template at the bandsaw and sand the edges until they’re perfectly smooth. Now, trace the pattern onto 5″-wide x 37″-long blanks and head back to the bandsaw to cut out the shapes, remaining approximately 1/16″ from all layout lines. Reposition the template on one of the blanks using a few spiral finishing nails or double-sided tape to hold it in place. Install a bearing-guided flush-trim bit in a table-mounted router and adjust the height so the bearing runs directly against the edge of the template. Using the template as your guide, follow the edge of the template with the bearing, trimming the waste from the blank as you go. A slow, steady feed rate minimizes splintering, especially when you’’re running against the grain. Your next assignment is to prepare legs to support the front corners of the chairs. You only need one for each chair because the table carries the load in the centre. Cut out a pair of leg blanks, then prepare a cardboard template for the curved profile that is applied to the bottom (see the plans for details). Trace the pattern onto the boards, cut out the curves and sand the edges. For maximum strength, I used a couple of 2″-long x 1/4″-diameter galvanized carriage bolts to secure the legs to the chair frames. Line up the parts so the front of the legs are flush with the outside of the front cross brace. The bottom edges of the side supports need to be 8 1/4″ from the ground where they meet the back of the front legs. When everything is positioned correctly, use a couple of clamps to hold the parts in place while you drill 1/4″-diameter holes for carriage bolts. Install the bolts with the nuts and washers situated on the inside of the seat frames, where they will be hidden from view. Also, make sure the holes are located so they won’t obstruct the armrest brackets that will be added later. Now, bolt the sides of the chair assemblies to the front and rear table legs following the same procedure. 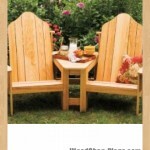 Now you can continue by adding the backrests, seat slats and armrests. Cut out blanks for all backrest slats required to complete both chairs. Don’t worry about the decorative profile at the tops for now; you’ll cut those details later, after the slats are installed. The slats are attached to the rear braces with glue and screws, but first you need to get them all lined up using clamps to hold them in place temporarily as you make adjustments. Make sure there’s a uniform gap between the slats and check to see that the edges are flush at the bottom before drilling screw holes. Two screws for the narrow slats and three for the wide ones will do the job. As mentioned previously, the backrests are supported at the top by braces that rest on those odd-shaped vertical rear leg sides you prepared earlier. Now is the time to bolt the remaining vertical supports to the outside of the chair frames and prepare the horizontal braces for installation on top. Before attaching these parts permanently, use clamps to get everything lined up. You will know the pieces are positioned correctly when the front edges of the side supports are perpendicular to the ground and the leading edge of the cross braces sit flat against the backrests. When you’re totally satisfied, bolt the side supports to the rear legs, screw the cross braces to the tops of the supports and fasten the backrest slats to the cross brace with screws installed from the front. 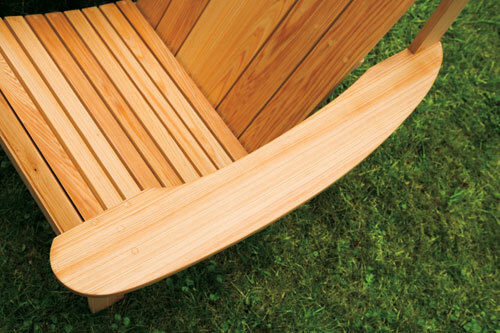 To help increase rigidity, add a second horizontal brace to the midsection of each backrest, to tie the slats together lower down. This brace is positioned 11″ below the upper horizontal backrest brace and attached with screws installed from the front. The next step is to prepare a cardboard template to lay out the decorative profile on the tops of the backrests. Create the template’s pattern by expanding the grid diagram included in the plans or downloading full-sized plans at Canadian Home Workshop templates. 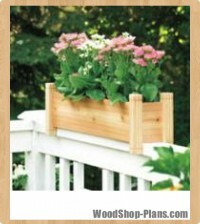 Trace the pattern onto the slats and cut out the shape with a jigsaw. Sand lightly to smooth the edges. Your next task is to prepare the slats for the seats. Pay attention to the angle of the bevels shown in the plans for the slats situated near the front. Starting from the front and working your way back, use glue and screws to secure the slats using spacers to set the gap between the slats. 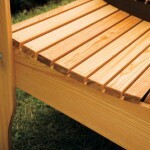 A dab of glue and one counterbored screw on each end is all that is required to hold each seat slat in place. At this stage, your settee is finally starting to take shape. 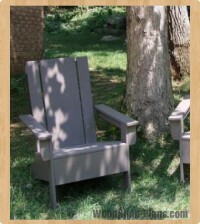 All you need to do now is add armrests and this project is ready for finishing. Expand the grid diagram included in the plans to prepare a full-sized template for the armrests (or print patterns from the download on page one). Transfer the pattern onto hardboard or plywood to make a template so you can use the pattern-routing technique described earlier to shape the parts. After the router has done its work, notch the back end of the armrests to fit around the rear leg sides. Install the armrests so their inside edges are flush with the interior faces of the legs at the front and the notches fit tightly around the rear leg sides at the back. 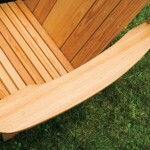 Now cut out and install a pair of curved brackets to help support the armrests at their fronts. The grid diagram for these parts is also included in the plans. Now that construction is complete, you can fill all the screw holes with tapered wooden plugs and sand the entire project to prepare for the finishing stage. When it comes to outdoor projects, there are many finishing options to choose from, including paint, exterior-grade stains, or a variety of UV-protected clear finishes. All of these choices require some level of ongoing maintenance to keep them looking good. I chose an often overlooked alternative that requires very little work to maintain. I decided to leave my settee unfinished and allow the UV rays from the sun to turn the wood a distinctive grey color over time. This technique results in a natural patina that can’t be replicated from a can. The only maintenance required is an occasional cleaning with a spray washer and indoor storage during the winter to protect the project from snow and ice. Now, find your favorite chatting partner and take a seat together.